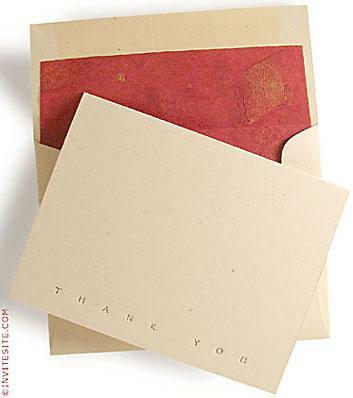 Letterpress printed thankyou note in subtle gold ink, with mango lined envelope. 100% postconsumer recycled stock and treefree envelope liner. Fold at top - tentfold design. Opens flat to 8.5 x 5.5 inches. Natural recycled cardstock with matte finish. Matching envelope. Red mango leaves envelope liner (assembly required - gluesticks included).